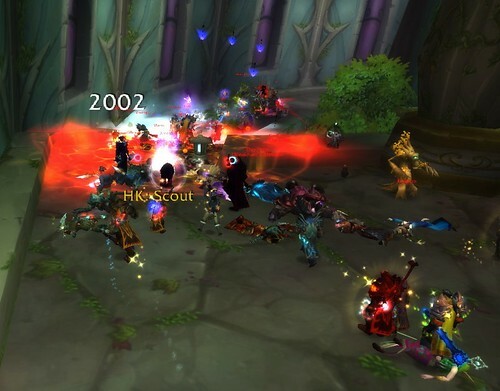 Finding a guild in World of Warcraft can be a daunting proposition if you're a casual player. You don't want to be a "hopper", one who can't stay with a guild for more than a couple months because, ewww, you didn't know they did or expected "that", whatever "that" happens to be. You want to get it reasonably right the first time. There might be a temptation to be a mercenary, just come into a group when they need that 10th person, but the game is designed to favor a guild experience. The perks, such as reduced cost for vendor items, faster movement speeds, ease of accessing a bank, to name a few, tend to push people toward the collective setting rather than being a lone-wolf. So how does a casual player find a guild? 1) You can hang out in any major city and read recruiting texts. Generally speaking, they won't be quite so cheeky as the above. A good recruiting statement tells you a bit about the guild; raiding times, casual/hard-core/family friendly. whether they require a certain voice chat and what kind of perks they might have. 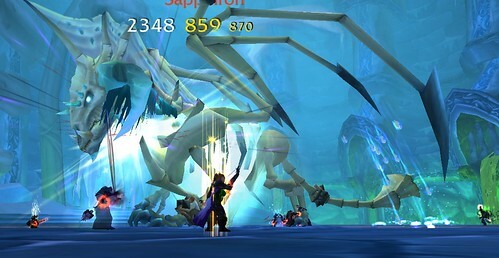 2) You can check the World of Warcraft Realm Forums or the Guild Recruitment forums. Guilds looking for members will post an "ad" of sorts, detailing what they are looking for and what they offer. I recommend sticking with your realm forum unless you really hate your realm and are looking for a change. The Guild Recruitment forum has so many posts it can be hard to sift through them. 4) If someone is asking in Trade or General chat for more people to run a raid or if you use the "Looking For Group" tool, you can ask the people in your group about their guilds. Those of us leveling toons other than our mains, have bemoaned the fact that people don't want to chat when they are in a group. "I just say 'hi' and you'd think I had the plague." For most people, end game is where it's at and they are running 5-mans to level and raid for transmog gear or to get something done faster than soloing. The best chatting is when you get 3-4 members of a guild in a 5-man or hook up with a handful seeking more bodies for a raid. They tend to be amenable to talking about their guild. But, don't take it seriously if they tell you to "bugger off" in any sort of fashion. It's not you, it's them. I have some suggestions for a casual person to help them find the right fit. This takes a bit of work on your part, but the end result should be a guild you can be happy in for a very long time. A) Review just how much you can play. Be honest. If you get home at 6 p.m. and have to be in bed by 10:30 p.m., how much of your evening can you devote to WOW? Do you have a spouse, significant other, kids, pet, etc., that needs some of your time every night? Do you have home obligations such as taking out the trash, yard work, cleaning, dishes, etc, that have to be done weekly or daily? What about food and just "you" time? You need to do an honest assessment of how much time you can spend playing the game. No sense joining a guild that raids Monday, Thursday and Saturday from 8-12 if you can't play until 12 during the week and every 3rd Saturday, you have to go visit Aunt Clara. Know just how much time you have. B) What are you looking from the game? Do you want totally end-game raiding? Is it important to you to have the newest shinies? Do you like attacking the other side? Do you want to see older content which you might have missed as you leveled? Knowing what you want out of the game is very important so you don't join a guild where end-game raiding is everything and you want to see Molten Core, for instance. C) Armed with those two items, you can begin a search. As I said above, I don't believe the Guild Recruitment Forum is a good use of your time. You'll spend way too much wading through posts from realms you have no interest in moving to. Go straight to your realm and look at that forum. Because most realms are connected, you will have to hit the forums of your connected realms, too. I'm on Llane, which is connected to Arygos. I've found that guilds who are on Arygos don't remember to post to the Llane forum, and vice versa, even though we're drawing from the same pool of talent. D) Read all the recruitment posts. That could take time, but read every.single.one. Do you like what you see? A good recruiting post tells you what kind of guild they are; hard-core, family friendly, casual, PvP oriented, etc. It tells you about raiding; if they are looking for specific classes to fill their ranks, for instance. There should be raiding days and times listed, as well as technical requirements for raiding such as which voice server they use. They should also give you some of the perks of guild membership. It's, essentially, the same as the above recruiting statement but not limited to the Twitter-like post in the game's chat forums. It should be comprehensive, allowing you to decide if you want to research them further. E) Look them up on the WOW forum. At the upper right of the forum box, type the guild's name in the search box. (Here is the page for Spectacular Death to illustrate.) Check out their achievements. Check out the roster. You can search for how many trolls or paladins they have, how many level 100s and level 1s. I wouldn't shy away from any guild that is brand new. Spectacular Death was new once. If you like a challenge or the opportunity to help a guild get achievements, a brand new guild can be the way to go. It's so much fun to see the guild achievement pop up on the screen. It depends upon what you're looking for. F) Make a list of all the guilds you're seriously considering and who is their guild master/mistress. Google them. Seriously. Type the guild name into a search engine and see what comes up. If they have a web site, go there. What does it look like? Is it friendly? Is it up-to-date? Does it have public information that gives you an idea of the kind of guild they are and whether what they do is what you want to do? Remember, if the guild has an on-line presence, chances are very good they have a section that is not available to the public, that you'll only see once you're a member. A good guild, even if they are brand new, has thought about their online presence and has a lot of information for potential members available. You should be able to determine if what you see online is what you'd like. Saving Tyrande from the Horde. G) Once you've done all that and have pared your list down to a handful, you can add the step of sending an in-game letter to either the guild leader or one of the officers. In Spectacular Death, we have a tab on our web site where you can see the officers. We have a Membership Officer. That person, also called "Recruitment", is probably your first contact with the guild. If you have questions or are interested in membership, contact that person or send an in-game letter to them or the guild leader. Alternatively, you can add them to your "Friends" list and when they log on, whisper to see if they would be available to answer questions about their guild. I get this all the time. I strongly, strongly suggest that you read where the person is before you ask questions. I'm happy to talk to you, but not when I'm in a raid. If they can't talk, thank them for their time and send them a letter or ask if you can talk at another time. I can't stress this enough, "Courteous people will get more of my time than uncourteous people." I will make time for someone who starts their whisper with, "Excuse me, I'm sorry to bother you but do you have time to talk about your guild?" H) If there is an application or interview required for membership, do it. Do not argue with me about whether you need to apply through my guild's web site. Application and interview exist for a reason and it's not your choice whether you will or won't do them. Is it annoying? Yeah, it is. But, speaking from experience here, we have turned down people whom we have discovered, through the application process, would not fit in. New guilds may take anyone just to swell their ranks to actually be able to run content and there is nothing wrong with that, but for a casual player, your time is precious so you want to make a good choice about what guild to join. 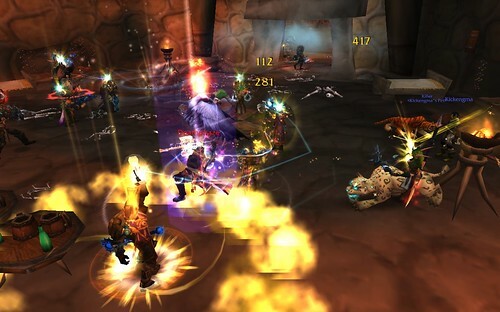 Jumping guilds is frustrating both for you and for the guild. Endure the application or the interview with grace and charm. You're finding out about them as much as they are finding out about you. As a side note, make sure you provide a contact email that you check more than once every other month. It is very frustrating to try to contact a potential recruit and have them not respond only to get a whisper 3 months later, "Can I still join? I don't check that email that I gave you very often." That says volumes to your potential guild mates and not in a good way. There you have it. These are my suggestions for finding a guild you can be a part of and stay with for a long time. Remember, too, that every guild has ups and downs. It's the nature of humanity. If people have been around a guild for a long time or show a dedication to the guild, chances are good, it's stable and will be a good fit. Do your homework. Know what you want. Know how much time you can play.